When Thabiso arrived at DreamWorker he had been unemployed for 3 months, with a 2 year old daughter and his grandmother to support. e having studied Electrical Engineering (N3) at Cape College, he had worked short term as a field marketer in the retail world. His dream was to be able to put his technical skills to the test. 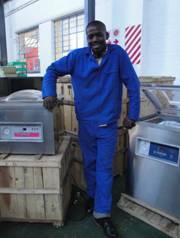 Thabiso’s enthusiasm, warm smile and general air of willingness did not go unnoticed! When the office had a call from Packit Packaging looking for a young person to train as a repair technician, he jumped to mind. His manager, Naasief Tape speaks most highly of him “We could see he had the right attitude and was really keen. I am really happy for the opportunity.